Be first to know when Check & Balances publishes new information. Governor Tim Walz (DFL-MN) was a social study teacher and not a math teacher, so its not all surprising to learn that the numbers in his budget don’t add up well for the economically disadvantaged and this is in large part because there is not a shared sacrifice with all income brackets and DFLers are too timid to create a truly fairer system. From an analysis of his own Department of Revenue, Minnesotans on the bottom half of the income scale will see an average tax increase of 9.9% while the upper half will only see a 5.9% increase. This structural differential is something the former social studies teacher can better understand. The burden of taxation falls harder on the lower income brackets than it does on the higher ones because a dollar is taxed differently in each instance. If every dollar from wage income to investment income were taxed equally then disparities like this would not exist. When Governor Mark Dayton (DFL-MN) proposed a restoration of the fourth tier of income tax he bent this inequity, but Republicans decried it as a tax grab. 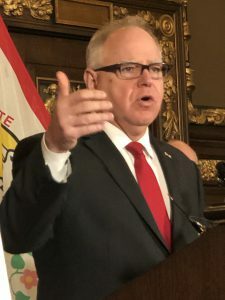 Now, Walz can see the full impact of his proposals and maybe it will embolden him to be more aggressive in support of his own agenda and more receptive to changes that come out of the legislative process now that this impact in known. During the CNN town hall, when US Senator Bernie Sanders (I-VT) stated his support for a universal reenfranchisement of the voting rights for felons including the Boston Marathon Bombers (Dzhokhar Tsarnaev and Tamerlan Tsarnaev) and sexual offenders and referring to them as “terrible people” he clearly missed the point. As did South Bend Mayor Pete Buttigieg (D-IN) and US Senator Kamala Harris (D-CA). Neither of these candidates for President grasped the opportunity to discuss this issue based on restorative justice and call the nation’s attention to the fact, linkage of voting rights with felonies was a Southern Strategy to violate the 15th Amendment (Voting Rights for Black males) and the installation of Jim Crow Laws. This is something northern states adopted and should have never occurred. Granted, societally laws can be passed to exclude certain “objectionable people from participating in a society based on acts they have committed against society, but that is a separate issue. It would be easy to deny voting rights to a convicted terrorist or child molester, but the rash of non-violent offenders that inhabit prisons across the nation is a moral injustice and their loss of enfranchisement only exacerbates their reintegration into society. Additionally, the counting of these people as residents of the communities in which they are housed is another moral outrage. Why should an incarcerated person be counted as part of the census in these communities? Why, when military members join up are, they afforded a “home of record” while they travel about the country and throughout the world, but ultimately know where they are from, couldn’t a prisoner be giving the same rights and privileges? Wouldn’t this keep them connected to the place they are from rather than the situation in which they exist? Also, the losses incurred for the communities they left is an example of how those communities lose not only because of the crime committed, but the count of the person, which results in lower federal and state funding. It structurally erodes the community. The DFL House Majority is defining its negotiating position as they pass their Omnibus Bills, and the House Republicans are trying to obstruction and drag out the process as much as possible. Which was the tactic the DFL House Minority used from 2017-18, which resulted in their electoral victory. House Minority Leader Kurt Daudt (R-30A, Crown) is nearly shedding crocodile tears to establish his moral objections to various pieces of legislation and playing more for the cameras which are recording the proceedings rather than to his House colleagues. For example, last night during the debate on the Jobs and Economic Development Finance Division Omnibus Bill HF2208 there were nearly 100 Amendments most brought by Republicans and the debate on the measure lasted two days. If this is any indication of what to expect when the will be a floor session on Sunday. Republicans may still not figured out they are not in the Majority, nor do they set the rules. The problem is the Republican Party is the anti-Government Party and the DFL Party is the pro-Government Party and because Donald J Trump (R) is the titular head of the Republican Party and because of him, Washington DC is the source of many problems our nation faces. No matter how sound Daudt’s philosophical points of rhetoric are, they will not be heard in the era of Trump. They should stop trying to prove a negative and stand for something positive. As Governor Tim Walz (DFL-Mn) and the House DFL tries to advance an agenda in direct opposition to Trump they are winning. If in each instance they can tie the issue at hand to a reaction against Trump they have the weight of the argument on their side. The problem with trying to deploy the same strategy the DFL used before is what the endgame is. For the DFL it’s to make government work better for Republicans it’s to burn down the house. It’s a significantly different premise. The use of state preemption to prevent localities from changing local ordinances to adversely impact business in places where Republicans have no political toehold i.e. Minneapolis and St Paul; is now a part of the Budget negotiations. Senate Majority Leader Paul Gazelka (R-09 Nisswa) seeks a universal standard against changes in work rules or the minimum wage, which is a direct affront to efforts in the two major cities. This issue may be a significant obstacle to the final negotiations because of DFLer’s support the traditional Republican idea of local control, which is diametrically opposed to this idea. As Republicans cherry pick the application of local control while doing the work for business interests over the workers, they navigate the incongruity. As we are observing the House Floor sessions and the ensuing debate it is clear the DFL House Majority is setting an agenda, which is closely aligned with Governor Tim Walz (DFL-MN) and is a vision for where they would like to the state to go. Conversely, as we view the Senate Floor sessions and their debates it is where Senate Republicans want the state to remain and go no further. This is setting up an interesting negotiations period which has been consistent since the start of the 2019 legislative session. The DFL wants to forge ahead and conquer new territory, expanding their reach and Republicans want to stand pat and prevent any governmental expansion. The problems are these two clashing ideas will not be faced directly until the 2020 election and then not acted upon until 2021. The battle over a forward-thinking advancement agenda versus a recalcitrant, retractive and resistant position is structural at odds and not likely to result in much movement. As we have often said, as ideologues Republicans view compromise as capitulation, a violation of their fundamental principles and ideals. If they cede any ground they believe they have eroded their own purchase. DFLers on the other hand view this time as one ripe with possibilities and opportunities. This vision of the future is far brighter and inviting because of what it could be, not darkened by what it is. Republicans see governmental expansion and a threat to personal liberty, while DFLers see the benefits of collective action. It is an argument of individualism versus communitarianism or as we see it an aspirational agenda to be metered by the reality of Republicans holding one of the levers of power, destined to provide situational reality. Yesterday, House Speaker Melissa Hortman (DFL-37B, Brooklyn Park sent a letter to Senate Majority Leader Paul Gazelka (R-09, Nisswa calling for public meetings to help in clearly defining the starting points for budget negotiations. The use of the word public is very clear as an attempt to provide transparency during the process. She proposed a number of meetings during the holiday break April 16th, 17th or April 22. At this time a side-by-side spreadsheet can be assembled enabling a one-to-one comparison. We expect Gazelka will also make his response known publically. In the 2000s, first during the Governor Jesse Ventura (IP-MN) when Rep Tim Pawlenty (R-MN) was House Majority Leader, Republicans began looking at government in a unique way. This was the 2003-04 Buget. They only acknowledged inflation on the revenue side of the budgetary formula, but not on the spending side. This they argued put government on “autopilot” and prevented any curtailing of government spending. This is akin to a zero-based budgeting model, which puts every expenditure at zero and then forces the advocates to argue in favor of a spending figure they need without establishing the baseline of the previous year’s expenditure as the starting figure. DFLers, on the other hand, support the existing programs and cede the previous expenditure as the baseline and any action short of an inflationary increase is deemed to be a cut and any amount over that figure to be an increase in funding. Additionally, DFLers want to stabilize the funding sources to enable there to be an adequate future funding source. This differential in approaches for viewing figures are the crux of where the debate over the funding for the 2020-21 Budget start. The problem is it is effectively an apple to oranges conversation. Sure, both sides acknowledge they are talking about fruit but that is where the similarities end. It appears the question rests on the issue of duration. DFLers want to create a system that is sustainable over a timeframe greater than a biennial budget and Republicans want to address the current situation and witness the result of the 2020 election and see where things stand afterward. It is a long-term versus short-term approach. Republicans need to stand strong in order to have their fundamental argument of being the only advocates for reining in spending and painting the DFL in a trite/traditional manner as tax and spend liberals. Republicans are hostile to untethered governmental spending, where the scrutiny of what is being spent isn’t placed under a microscope and areas of spending found deficient are eliminated. The reduction in overall spending is what is seen as a success by the GOP, so it makes sense to give them some type of victory they can tout. The elimination or consolidation of some programs or expenditures would be a major bargaining chip. In our conversation with Senate Majority Leader Paul Gazelka (R-09, Nisswa) after Governor Tim Walz’ State of the State Address, we found his response to our question regarding their approach being a hard no on tax increases, of “Well, our first budget has no tax increases…” to be potentially beneficial to the forthcoming discussions. Since the two sides are made up of Walz and House Speaker Melissa Hortman (DFL-36B, Brooklyn Park) against Gazelka, which he also acknowledged in our post State of the State interview, then he will be in the position of either defending or blocking. If each position he advocates is seen as negative there will be little progress, but then the question is does he warrant one-third of the calculation when he can obstruct the entirety? We believe people of strong conviction often see compromise as capitulation rather than a robust exercise in forming an agreement. The more extreme the ideological view the more intractable and hence the less willing to move. We will again posit our position on the best negotiation is where both sides a mutual dissatisfied rather than mutually satisfied because then each side is able to argue they fought for what they could get and live to fight another day. In the 1980s, the cost of tuition was based on the state of Minnesota providing one-third of the cost of instruction. Now, it was often a challenge especially in bad economic times, but at least with this, as a rule, people knew what they could expect and then measure that against what actually occurred, and then come back later to adjust the formula. Today, this concept has flown by and the state barely meets 25% of its obligation, in fact, it not even seen as an obligation. While the debate rages about holding down the costs of tuition and the rise of student debt we would like to address a significant concern that has arisen and is not even a part of the conversation. The issue we would like to broach is the homogenization of costs for undergraduates at the University of Minnesota. As a land grant college, formed in 1851, seven-years before statehood and later funded by the Morrill Act 1862, and was to provide free tuition to its students. We are a long way from that idea, but also, we would like to get back to the issue of fairness to the undergraduate population. The cost of tuition at the University is not an honest figure. The largest population at the U, the College of Liberal Arts (CLA) subsidizes all other programs. A CLA student does not just pay their own cost of instruction but they subsidize the graduate students in CLA as well. Just like in taxation the greatest burden falls to the Middle Class, or in this case CLA. CLA also subsides the other colleges with higher costs such as engineering, computer science, medicine and all programs with a far greater earning potential than an English major. There should be a class action suit against this homogenized tuition structure because the student debt for a CLA graduate is far higher than it should have been if they only paid for the cost of their own instruction. As we listen to the debate of whether the state should continue the Health Care Providers Tax, we keep hearing the argument because there is nothing else. This is not true. We have discussed the idea of a tax on sugar on high fructose-based products. Even the industry is now running commercials discussing how Coke, Dr. Pepper, and Pepsi are working to reduce the amount of sugar in soda beverages and produce smaller size portions. They reference this as something “your mother” would agree with, but we believe the more effective manner to reduce consumption is to tax sugar a what it is a toxic substance. The evidence is clear, early onset diabetes, childhood obesity, and heart disease are all attributable to high levels of glucose, i.e. sugar in the bloodstream and the long-term effects can be addressed if the consumers pay for the costs upfront. This is an example of a user fee being collected to render health care to the population affected. We first discussed this February 21, 2019, Health Care Solution: Tax Sugar and High Fructose Corn Syrup. As we have learned from Chair Lyndon Carlson (DFL-45A Crystal), this will prepare the bills for floor action and we understand this will occur during the week as well. The House is on pace to have much of its work done prior to the Easter/Passover break on April 16th. This is a significant difference from the Senate, which appears to be moving along more gingerly and showing no sense of urgency. Does Checks & Balances Deserve Credit/Blame for Bachmann’s Political Rise? Checks & Balances is experiencing some dramatic changes. We are creating a more robust site for your viewing pleasure. Checks & Balances is the site of the first paid political advertisement in the history of the Internet.